Basically you have to rate the persons signarture or/and quotes of the person above you out of 10 e.g mine to start with. The one i did before got blocked.....long story! I remember that, what did you say? 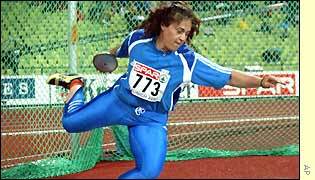 "Cover me in honey and throw me to the lesbians"
Revengeful angel is a 35 year old Hungarian female shotputter....picture it!!!! remember we won it 1st with 11 scots, beat that. The individual who looks within instead of without, who looks to correct their own imperfections, and who treats others as they wish to be treated will have the door of discovery swing wide open for them. did you make this up ? If so, why take diffrent saying's and stick them togther with improper use of the english language? I.e. "Look without" is that true when crossing the road ?? if not where's the quote from ? And they are definetly plagiarizing! It's ironically appropriate, you are entertaining me a complete stranger and don't ever doubt for a second my friend, you too are making the angels wings flutter with glee. Im a missing somthing , where's the irony? Overall 3 because of the complexity of figuring out what the second one is , and the combining of two saying's into one. keep em short simple and straight to the point ! "while I may not agree with what you say , I'll defend to the death your right your say it"
i aint sensitive about football why what were u gonna say eh, eh???? TT who the heck is dead man perez? But I still don't get the dead man thingy. Must be my age. 9.5 out out 10 just cuz I know how cute you are. Harness the energies around you and you'll be able to do wondrous things. Not sure, who to rate, since you all seem to be rated. Oh well, I'll give 10's to you all. It is out of 10 right? "Do not speak for those who can speak, but speak for those who cannot." very thought provoking, and very tru!!! 10/10!!! well tendo.....I have to admit I like this game of rating the person above.....and as for yours, I'd have to say your's make me wana go there, in fact I feel bad for never having been....I am intrigued. 10/10 good job-bob! (can I call you bob?? LOL sorry I'm a bit of a goofball LOL) seriously tho, great work tendo!